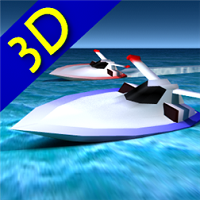 3D Boat Race is a free racing game from A Trillion Games, but it’s more than just an ordinary racer as you can customize your ride before racing in one hundred tracks. Not only are there numerous tracks, but there are multiple modes as well and you can challenge other players via the leaderboard as well. There are three game mode, timed slalom, simulation and stunt, and a couple of steering options here as well. The Boat Stunt mode is freeform where you simply maneuver your boat around obstacles including exploding balls, loops and jumps. This is the easiest mode in the game and perfect if you’re just starting out. The 3D graphics are very good, and the implementation of physics in simulation mode is one of the best so far. 3D Boat lets you control the game using Windows Phone accelerometer or a virtual joystick if you play the mobile version. The controls take a bit of getting used to, but it’s worth learning them as the game offers several tracks and views. The game also runs in a vertical or horizontal position, and the slalom and simulation modes are both exciting. 3D Boat allows you to challenge other players, and once you’re playing it does feel like you’re going at 200 mph. For many though, the option to customize your speedboat by painting is one of the best features in the game. If you’re playing this in Windows 8 desktop by the way, you can use your keyboard, mouse or touch screen, depending on what works best for you.